The enduring rumors are true: France is good at cheese. Studying abroad there in college was a semester-long all-you-can-eat buffet, and not just in Paris, either. The Franche-Comté region (where I stayed, on the Swiss border) is home to the medieval city of Besançon, whose university has been thriving since the 15th century. More importantly, it’s home to a hard regional cheese simply called Comté. Comté is ubiquitous across Besançon in a way almost no cheese is here in the U.S. It sits on the table to begin and end every meal. It’s sold in upscale groceries, gift shops, farmers’ markets, Aldi, and gas station convenience stores (alongside little Oscar Mayer–style packets of foie gras). Its mild Swiss-like notes of nutty sweetness make it eminently snackable, with a sturdy rind that allows for scraping off every last nibble of cheese with your bottom teeth. It became a staple of our diet, my friends and I sharing a wedge at the Place De La Revolution as we lamented our most difficult professors. On our trips into Paris, however, the availability of Comté would plummet, and several Parisians I asked insisted they’d never heard of it. Perhaps they were just being snooty about the more provincial regions of the country, but I believed them. After all, it’s a land so lousy with cheese, who could keep track of every single one? 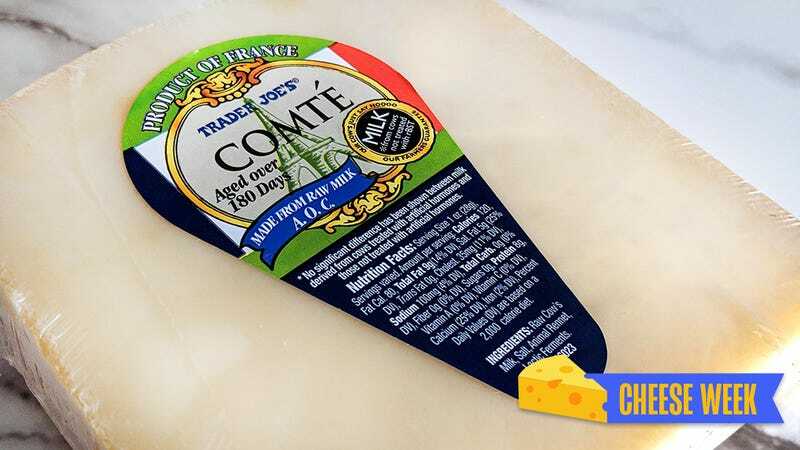 Which makes it doubly surprising that Trader Joe’s, of all places, has reliably stocked Comté stateside for years, providing wistful homecomers the chance to continue feeding their acquired French habit. I have no idea what might have led to this landmark imports deal, but the cheese is legit, aged 180 days, A.O.C. designation and all. Unlike some other choice French cheeses like Mimolette and Morbier, whose availability and prices can vary wildly, the humble Gruyere de Comté sticks around at a rather fixed price, ever stalwart and delicious. It’s the type of cheese that’s best consumed solo, rather than forcing its subtle flavors to compete with a charcuterie board. And as I can attest, it’s the perfect way for young people on a budget to kick off a casually cultured evening. Slice it up for yourself and a friend, twist the cap off a bottle of second-from-the-bottom-shelf pinot noir, and vent about work as you joyfully spoil your appetite on this coziest and least pretentious of fromages. How can you tell if blue cheese has gone bad?